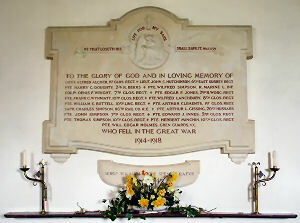 Located in the parish church, Didbrook, Gloucestershire England. Listing and photograph courtesy of Alf Beard. Amendment to Harry Cecil Doughty entry courtesy of Mark Scott. CLEMENTS Arthur Pte 7460, 1st Gloucestershire Regt, killed in action on Wednesday 4 November 1914 age 26. Son of John and Emma of Vineyard Street, Winchcomb, husband of Elizabeth of 262 High Street, Cheltenham. Born at Stanton Worcestershire. Commemorated on the Menin Gate Memorial, Ypres, Belgium.